This is a small site powered by a Joomla! CMS. 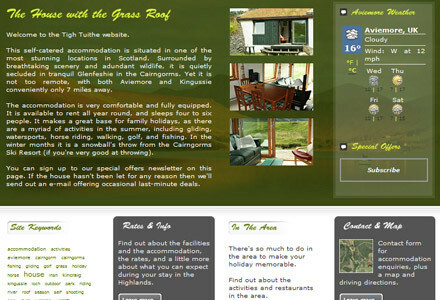 The idea was to create a site which showed off the holiday house, but also promote the area by compiling a catalogue of all the nearby activities and restaurants for holiday makers. The site includes a tag cloud to promote key words in a non-intrusive way, a weather feed for the area (with a four day outlook), and light boxes for the images. There is a satellite map in the contact section which shows interested parties how fantastic the location is for their holiday.